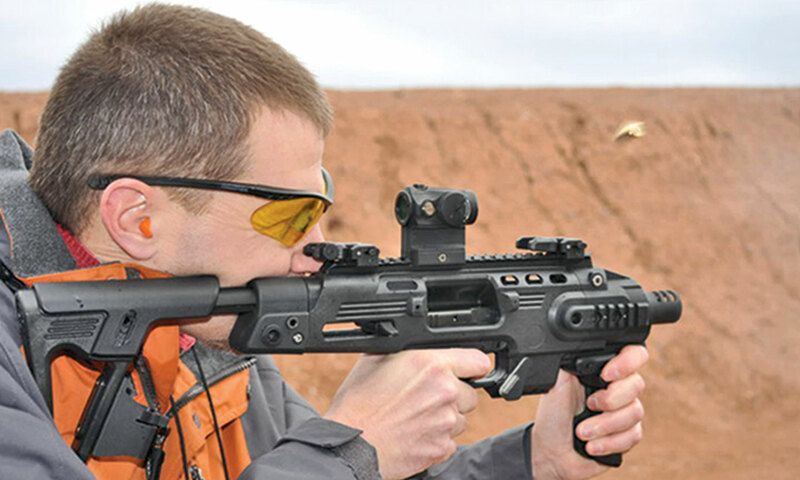 The CAA Micro Roni Stabilizer - Gimmich or Go-To? 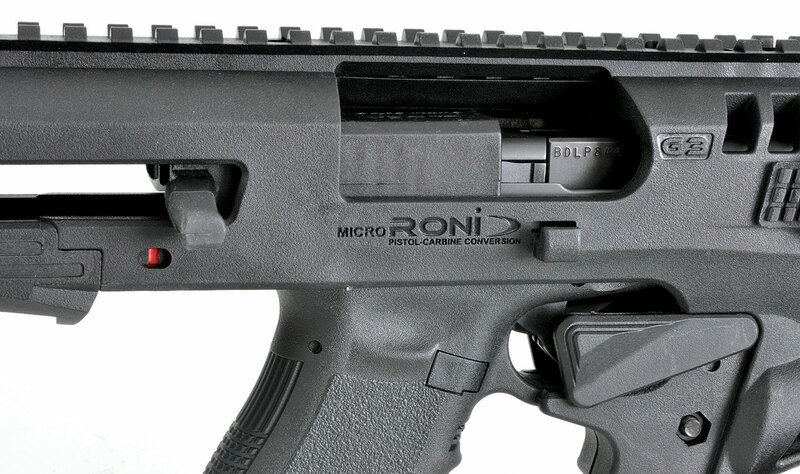 The Micro RONI Stabilizer with Glock installed is shorter and lighter than any other faux SBR Tarr has ever shot and allows for carbine-like accuracy out of a handgun. I’m not sure where I was when I first saw the original RONI carbine conversion kit from Command Arms Accessories (CAA)—perhaps the SHOT Show’s Media Day at the Range—but it was different enough that I remember stopping and investigating (usa.caagearup.com). The RONI was a big polymer shell into which you inserted your Glock (now other pistols as well). The shell had a stock so you could shoulder your pistol like a rifle, and a rail on the top so you could mount iron sights or an optic. However, after my initial peek at the product, I lost interest for a couple of reasons. First, the RONI required you to register your pistol as an SBR (short-barreled rifle)—after all, you’re putting a stock on a pistol, which under current federal law is illegal without additional unConstitutional paperwork infringements. Actually, the ATF has ruled that merely possessing a RONI and a pistol that fits inside it constitutes an SBR. The NFA is completely and totally un-Constitutional, and I hate doing anything that legitimizes it, such as jumping through extra legal hoops and paying more money for something for which I shouldn’t have to. Second, the RONI, at nearly $400 at the time (if I remember correctly), was nearly the cost of a pistol. It’s even more expensive now. Tarr shooting an original full-size RONI in 2010, not long after they were introduced. The Micro RONI is smaller and lighter, and the Micro RONI Stabilizer does not require registering your Glock as an SBR. 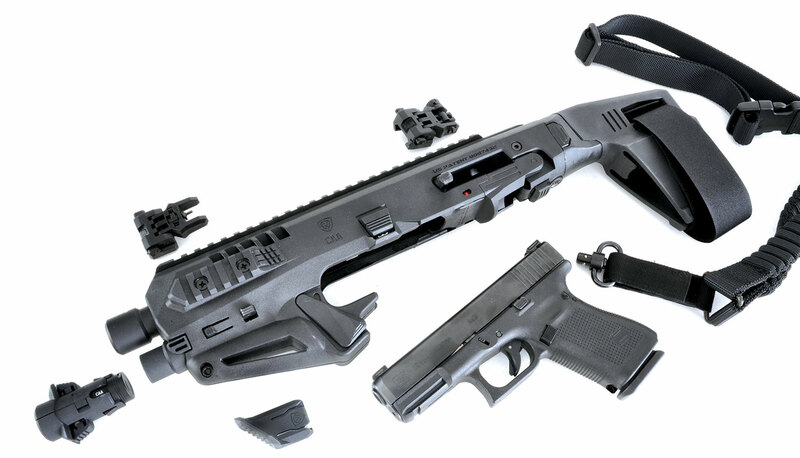 Subsequently, CAA introduced a slimmer version of the RONI called the Micro RONI, and then versions of the full-size and Micro RONI that replaced the stock with a stabilizing arm brace. For all my love of faux-SBR AR-15s with arm braces, for some reason the RONIs with brace just didn’t attract my attention, maybe because in photos I thought they looked a bit clunky, or maybe my brain was still stuck in its initial “not interested in RONI” gear. Luckily, my editor asked me to review the Micro RONI Stabilizer, and I say “luckily” because my eyes have been opened to not just this product, but its potential. First, let’s look at what the Micro RONI is before we address what it can do. My mouth keeps wanting to say “macaroni” instead of Micro RONI, but I fight it every time because I know where the name comes from—the designer named it the RONI after his daughter, and you don’t mess with somebody’s kid. 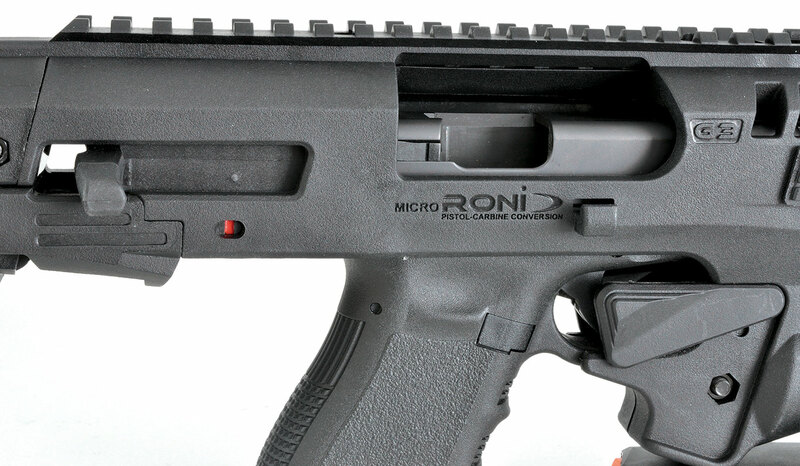 The only physical difference between the Micro RONI (as seen here) and the Micro RONI Stabilizer is the stock on the former and the arm brace on the latter. As I mentioned before, the RONIs are polymer shells that accept pistols and are designed to provide added utility. As the Micro RONI Stabilizer comes with a stabilizing arm brace instead of a stock, attaching it to your pistol is perfectly legal, and your pistol remains a pistol. 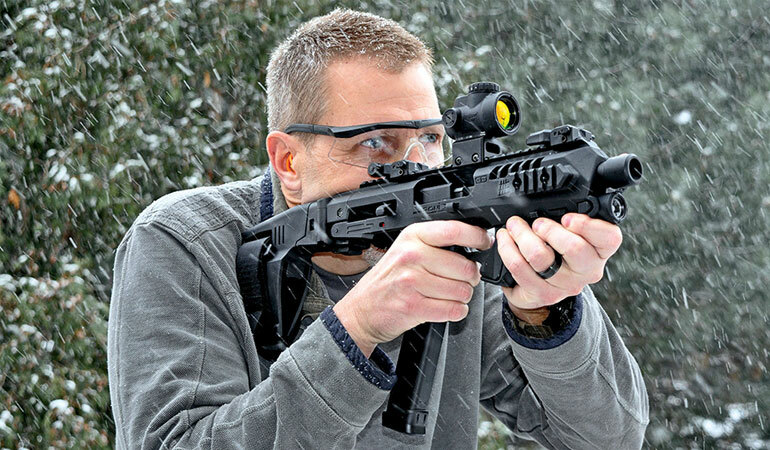 The only physical difference between the Micro RONI and Micro RONI Stabilizer is the latter replaces the folding stock with a folding arm brace. The original RONI models were designed for Glock pistols, but currently CAA makes the full-size RONI (with stock or arm brace) for a number of different pistols, including models from Beretta, CZ, HK, SIG, and Springfield, among others. 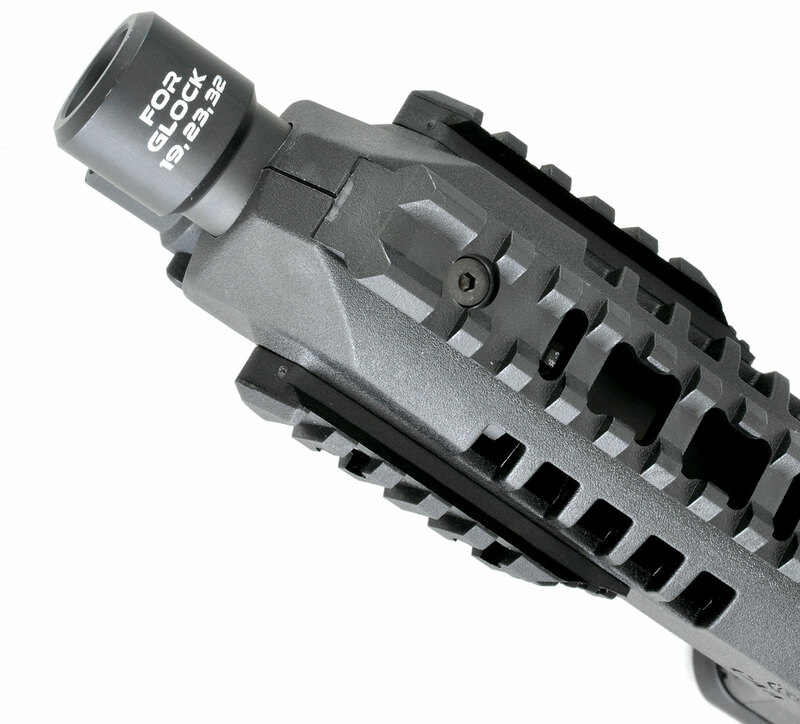 However, currently the Micro RONI Stabilizer is only available for the Glock 17 (22, 31) and Glock 19 (23, 32). I secured a model to fit the Glock 19, as it has been Glock’s biggest-selling model since its introduction and one of the best-selling pistols in this country, period. 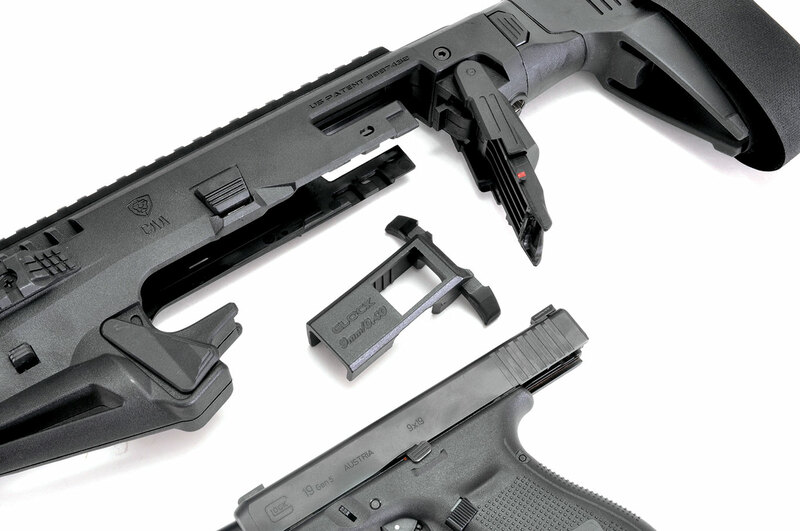 FYI, the Micro RONI Stabilizer only fits Gen 3 and 4 Glock models—more on that later. The RONI is available in black, green, or tan. The chunky Micro RONI Stabilizer doesn’t look like much, and its price tag seemed a bit steep for Tarr. At least, until he shot it. The limiting factor to pistol fit, I’m guessing, is slide profile, as what allows you to work the slide of the pistol once it’s inside the shell is a polymer charging handle that slips down over the rear section of the pistol slide. It weighs just .8 ounces, so it should not affect the weight (or reliability) of your Glock at all. The T-shaped charging handle fits over the top of the Glock slide, and it is inserted in the RONI’s receiver once you lower the gate. Tarr learned the Micro RONI works with Gen 3 and 4 Glocks, but not the new Gen 5. The charging handle is T-shaped, and where it fits over the slide, it has ridges (at least on the Glock model) that slip inside the slide serrations, locking it in place. It has a big cutout on top, so no matter what rear sight you’ve got on the pistol, the charging handle will fit over it, and it’ll still work in the RONI. The sights on my G19 are the taller-than-factory Trijicon HD XR sights, and they work, no problem. If you’ve got tall suppressor sights on your pistol, the front sight will fit inside the RONI fine, but rear suppressor sights are another animal entirely. The rear sight will bind, but it will be pressing against three polymer ribs inside the shell that are independent of everything else and seem designed to be consumable—which means you can grind them down if you need to and it won’t affect anything else on the RONI. It probably voids your warranty, but whatever. The Glock slide with the charging handle installed. Once the Glock is inside the RONI housing, the charging handle has no room to come off. Once the pistol is inside the RONI, the charging handle doesn’t have the space to slip or twist off the slide even if it wanted to—it’s an ingenious design that is amazingly simple. As the charging handle is attached to the slide, it reciprocates with each shot. The polymer walls in the Micro RONI are thick, and this piece is obviously built tough. There is a hatch at the bottom rear of the unit. Push in a button, slide the hatch backward, and then you can pivot it downward. With the hatch open and the charging handle attached to your slide, simply insert the muzzle of the pistol into the RONI’s body, tilt the whole gun upward, and push forward until the “extraction button” clicks. 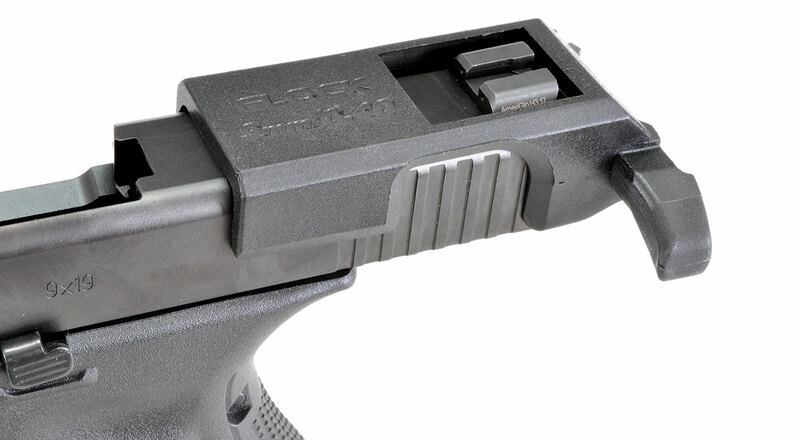 The “extraction button” is a bar that locks into the slot in the Glock’s frame rail, and is the primary lockup point for the pistol inside the RONI. Once the pistol is in place, close the hatch and push it forward, and it locks against the rear of the pistol. To remove the pistol, you have to pull downward on the extraction button on both sides of the receiver. Installing or removing a pistol, including installing the charging handle, should take you barely a minute. These are all thick, beefy polymer parts holding the pistol in place, and the Micro RONI is obviously designed to be durable and last a long time. The pistol frame absolutely does not move inside the Micro RONI housing. It is as rock solid a fit as you can get between polymer and polymer. Whoever was in charge of uploading the specs for the Micro RONI Stabilizer on the CAA web page apparently skipped the day in math class covering metric to American conversions. No, the stabilizer does not weigh 720 ounces (45 pounds)—although if it did, recoil would be pretty tame, am I right? That’s not even a misplaced decimal point—according to my new scale, the Micro RONI Stabilizer weighed an even two pounds empty. That’s 32 ounces, for those of you who went to public school, and less than 12 parsecs for you Hillary voters. With the brace folded, the Micro RONI Stabilizer is just 14.5 inches long and empty weighs just four pounds. The Micro RONI Stabilizer is just over 19 inches long with the stabilizing arm brace locked into place. With the brace folded to the side, the unit is 14.5 inches long. That makes this piece eminently compact for storage and transport, but be advised that the brace does not lock open or even have a detent, the brace just swings free, except when it is locked into place. You can shoot your pistol with the brace folded, however the brace does somewhat get in the way, and it will flop about unless you’re a lefty. The hinge and pushbutton lock for the brace are thick polymer, the pivot pin aluminum, and the brace itself is rubber with nylon straps for securing it tightly around your forearm. When you want to use the arm brace as such, you slip your arm through the opening in the rubber body in back, take a firing grip on the pistol, and then tighten the nylon strap around your forearm. It provides a very steady platform, and the angle on the front of the Micro RONI allows you to use your other hand to provide even additional support. While the brace itself is made by CAA, the brace design is licensed by CAA from SB Tactical, the inventors of the AR-15 pistol stabilizing brace. Those of you paying attention in class will know the ATF under our current administration wrote SB Tactical a letter stating very clearly that firing one of its otherwise unmodified braces from the shoulder was not illegal and did not change the legal definition of its pistol. When used in such a way, the Micro RONI provides a very short length of pull, but it is eminently usable. On the underside of the RONI receiver, right by the pivot pin for the brace, is a QD sling swivel socket. 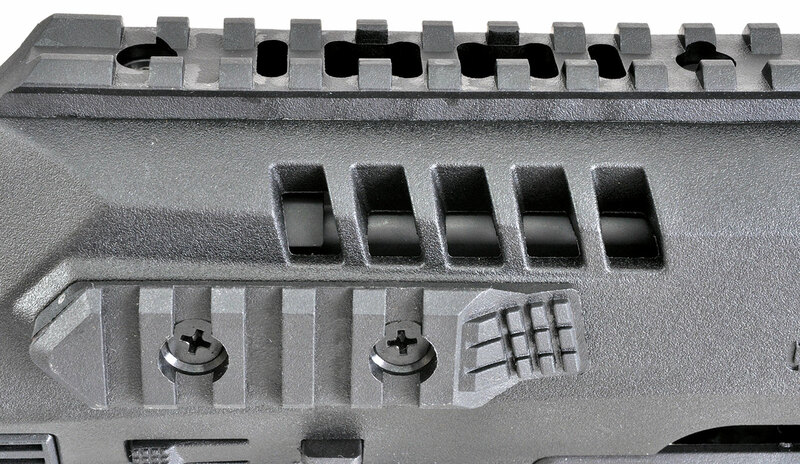 There are two-inch polymer rail sections on either side of the RONI near the front, and the rail atop the RONI receiver stretches for 10 full inches. The barrel shroud is clearly marked for Glock model fitment. Notice all the vents in the Micro RONI, to keep the exhaust gases from melting the polymer chassis. The Micro RONI isn’t all polymer—there is an aluminum barrel shroud in the front of the piece. When the pistol is locked into place, the shroud encloses the last quarter inch of slide, protecting the polymer from muzzle blast. The shroud extends three inches past the muzzle, and that’s what you see sticking out the end of the RONI. The shroud itself is clearly marked for pistol fit, to avoid any confusion or mistakes. To the rear of the shroud, on the top and sides of the Micro RONI housing, you’ll see vents to keep the polymer from getting overheated by the exhaust gases of the pistol. There are five vent slots on either side of the RONI chassis for cooling. Inside the left-most slot, you can see the rear of the aluminum barrel shroud where it covers the end of the Glock slide. 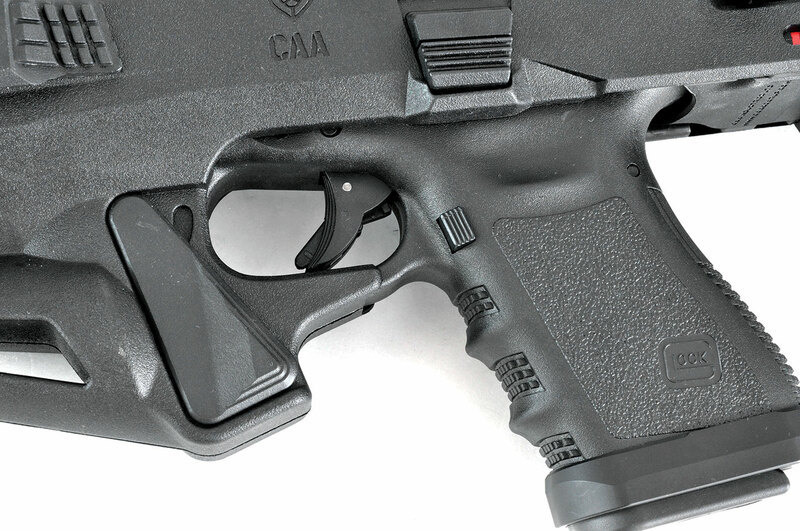 As the Micro RONI housing prevents access to the slide of the pistol, CAA smartly included a slide release on the left side of the unit. It is a big, square, serrated button that you push downward. It takes a bit of force to work….just like the slide release on the Glock. I found myself just using the charging handle instead, as it was quicker and easier. A closeup of the Glock inserted into the Micro RONI Stabilizer, wearing the charging handle. Notice how huge the ejection port of the RONI is. The ejection port on the Micro RONI is huge—almost three inches long and nearly an inch and a half tall. Your empty cases won’t have any problem clearing the gun. 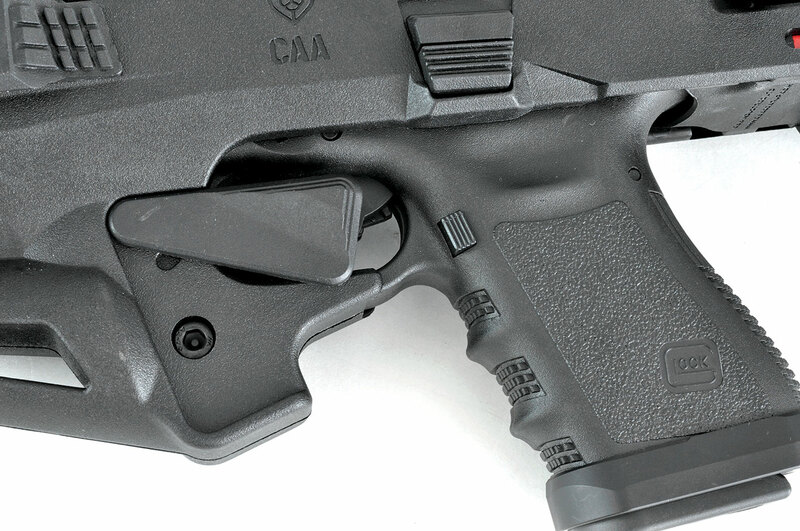 For an additional measure of security, CAA has included a pivoting trigger guard cover. If you want, you can pivot it upward and it will block access to the trigger. I wish the cover had more of a detent—it moves too easily for my taste, but that’s a minor complaint. With the slide of the Glock locked back, it’s even easier to see just how much room the engineers have given ejecting brass so they don’t hang up on the RONI receiver. When I first went to test the Micro RONI Stabilizer, I installed the new Gen 5 Glock 19 I had on hand for review, and ultimately learned that the Micro RONI doesn’t work with Gen 5 Glocks. Micro RONI Stabilizer with Glock inserted, showing the manual safety lever down. The tolerances inside the Micro RONI Stabilizer are tight enough that the new ambidextrous slide release on the Gen 5 Glock binds things up. Badly. The RONI’s slide release doesn’t work at all because of the slide pressure, and the increased side pressure on the frame was even causing trigger reset issues. The pressure was so much, when I tried to drop the slide by working the charging handle, even that didn’t work. I had to drop the slide by sticking a screwdriver inside the open ejection port of the gun and physically push down on the lever, just so I could get that pistol out of the RONI. When I swapped out the Gen 5 G19 for my personal Gen 3 G19, everything was roses—the Micro RONI worked perfectly. Considering the Gen 5 Glock is brand new, and there are 12.5 bazillion Gen 3 and 4 Glock 17s and 19s in the country (I looked that number up), this really isn’t much of an issue. Micro RONI Stabilizer with Glock inserted, showing the manual safety lever up and blocking access to the trigger guard. 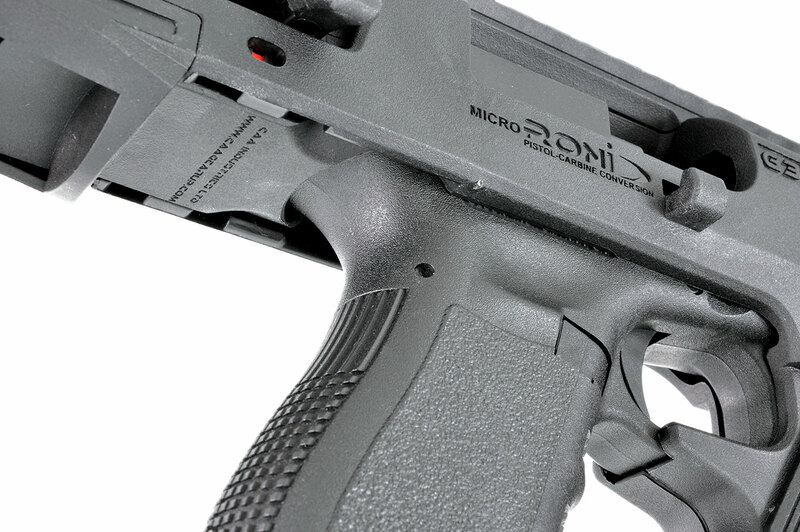 With the pistol installed, the Micro RONI Stabilizer balances right over the grip, which makes it very quick-handling. It also seems even lighter than it is. My only real complaint about the Micro RONI is an ergonomics one, and minor—I can’t get my hand as high on the pistol as I prefer. My knuckles press against the underside of the RONI chassis, and normally when shooting a Glock, I choke way up on it. And there was a little bit of a sharp edge and a tiny pointed piece of polymer left over from the mold that pressed directly against my thumb knuckle. Wearing gloves, you wouldn’t notice it at all, but I knew that it would slice me open the first time I pulled the trigger, so I took a file and gently removed the offending bit. The only thing Tarr didn’t like about the Micro RONI Stabilizer was the bottom of the receiver. There were a few sharp bits that wanted to cut his knuckles, and he wished he could choke up higher on the Glock. CAA offers a number of accessories for the RONI and Micro RONI, both individually and in kits. For this article, CAA sent me the Advanced Upgrade Kit, which retails for $175 and includes a single-point bungee sling, flip-up front and rear sights, polymer angled thumb rests, and a weapon light. 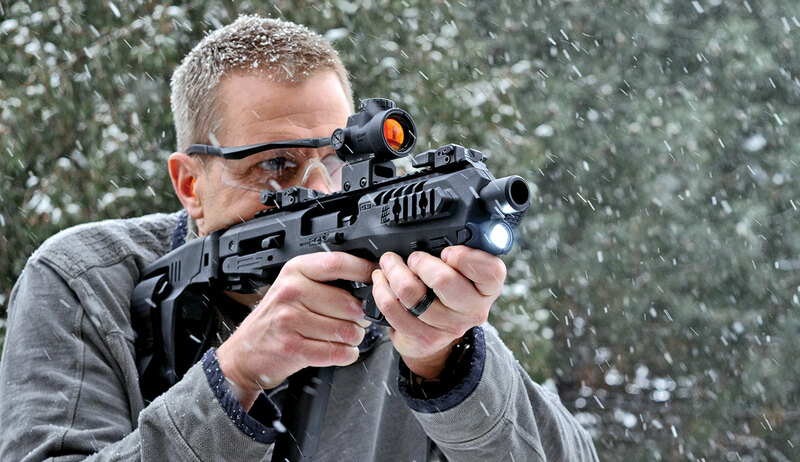 CAA included its Advanced Upgrade Kit with the Micro RONI Stabilizer, which includes a 500-lumen weapon light. The CAA flip-up sights are polymer and the price of Magpul BUIS sights without the quality. The polymer thumb rests are inexpensive and useful, provided you don’t mind the added width they add to the RONI. The bungee sling is great and sells separately for only $22.00. However, it’s the flashlight that is the killer piece in this kit. CAA sells this flashlight separately for $67.99, and I highly recommend anyone interested in the Micro RONI buy one. The Micro RONI Stabilizer with all the accessories (and a Glock) installed. Tarr didn’t think the piece looked right with a standard pistol-length mag and stuck in an extended 33-rounder. You might have been wondering what that thing is on the front of the Micro RONI Stabilizer, just underneath the barrel shroud. That’s the placeholder for the weapon light that CAA offers. Technically, it’s the MRFL—Micro RONI Flash Light. It just slides right in from the front and clicks into place, and has a click button to activate it on either side. The flashlight is amazingly small, weighs just 1.4 ounces, and features a high-efficiency LED bulb powered by one CR123 battery. It provides 500 lumens of light in a very wide, even beam. The Advanced Upgrade Kit for the Micro RONI includes sights and a sling, but one thing Tarr thought was a must-have was the 500-lumen weapon light that fits into a socket in the front end. With flashlight installed, iron sights and my Trijicon MRO mounted, the Micro RONI Stabilizer with empty Glock 19 installed weighed four pounds even. 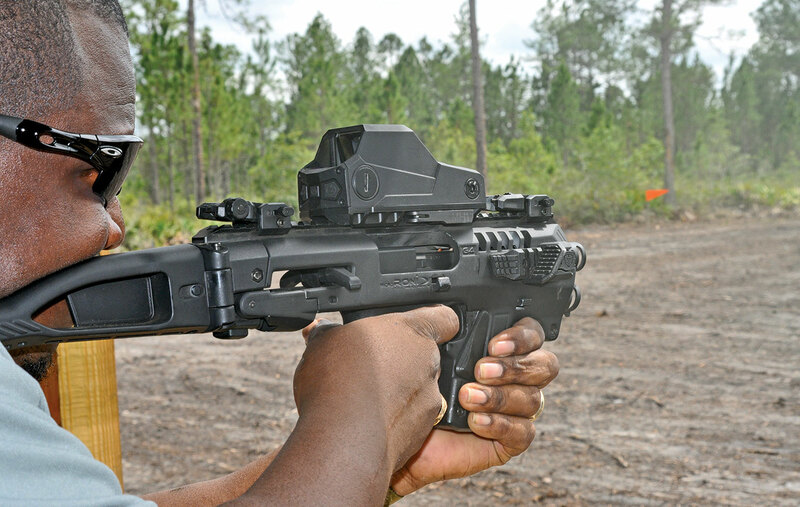 That’s pretty heavy for a pistol…but amazingly light for a 9mm faux-SBR. The Micro RONI is shorter and lighter than any other “long gun handgun” I’ve ever shot—MP5K, AR, CZ Scorpion EVO, etc. My older son thought it looked really cool. My younger son thought it looked really weird and asked, “Why this, instead of, say, an MP7?” So, I had to explain to him at length how the MP7 was not legal to sell to private citizens due to un-Constitutional laws, until his eyes started to cross, probably because he was off on Christmas break and I’d had talk radio on in the car quite a bit and had been lecturing him about politics a lot already—mostly about how the Trump Administration ending Obama’s “Net Neutrality” was not the world-ending calamity all his teachers and friends thought it was, but just people who love America ending a power grab by the government. How much more accurately could I shoot at distance? How much faster could I shoot accurately at distance? Once the Micro RONI Stabilizer was zeroed with the pistol inside, would removing and reinstalling the pistol change zero? After all, the sights are mounted to the RONI, and the Glock is attached to the RONI via its frame. So technically, there is no hard metal-to-metal connection between the sights on the Micro RONI and the Glock’s barrel. To answer these questions would simply require some serious range time. Seeing as the Glock-A-RONI (see what I did there?) legally is a pistol but functionally hovers somewhere between pistol and pistol-caliber carbine, I decided to do the testing at 50 yards—that’s a heck of a long shot for a pistol, but easy for a pistol-caliber carbine mounting a red dot, and about the furthest (realistically) that you’d want or need to use either for defensive purposes. Honestly, the biggest limiting factor I expected to experience in shooting accurately at long range with this package was the quality of the Glock trigger—or lack thereof. The factory trigger pull on Gen 3 and 4 Glocks runs somewhere north of 6.5 pounds and is far from short and crisp. Trigger pulls like that do not lend themselves to long-distance precision. Or precision, period. I’ve tweaked the striker spring and installed a TTI 3.5-pound connector (www.tarantacticalinnovations.com) on my Gen 3 G19 to bring the trigger pull down to just over four pounds, which is a weight much more conducive to hitting targets, whether the pistol is inside a RONI or not. I also installed the TTI aluminum magwell to help speed reloads—because why not? 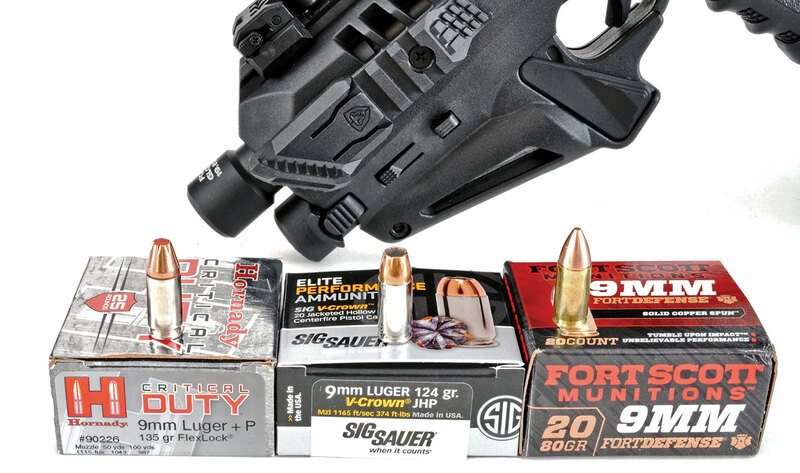 When zeroing the RONI at the 50-yard indoor range, Tarr used SIG Elite 124-grain JHPs. A short pistol mag made it easier to shoot off sandbags. My trip to the range was very interesting. As this testing was one in the middle of Michigan winter, all 50-yard testing was done on the indoor rifle range at my FFL, Double Action Indoor Shooting Center and Gun Shop in Madison Heights, MI. 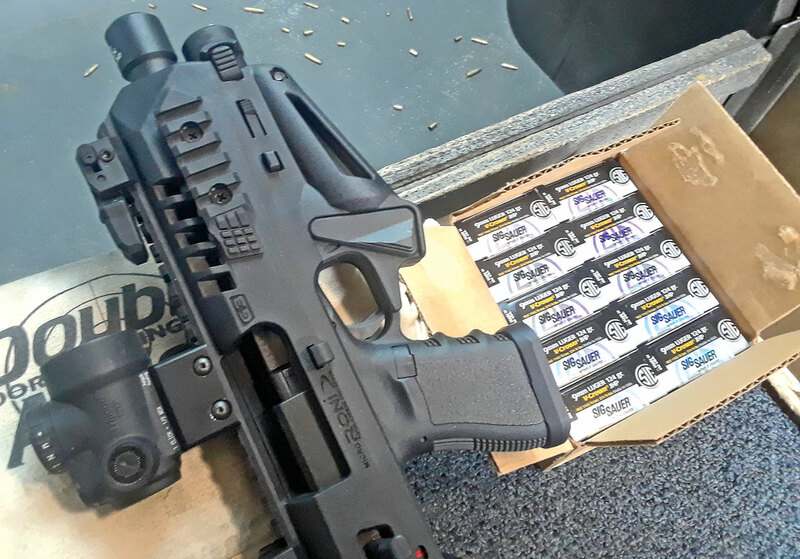 All ammo during this portion of the testing was the SIG Elite 124-grain JHP, which is nearly a +P load, and does about 1,160 fps out of this Glock. Target A: After initially zeroing the Micro RONI, Tarr tried to shoot for groups and discovered the point of impact moving to the right as the Glock settled into the RONI chassis. But then it stopped. 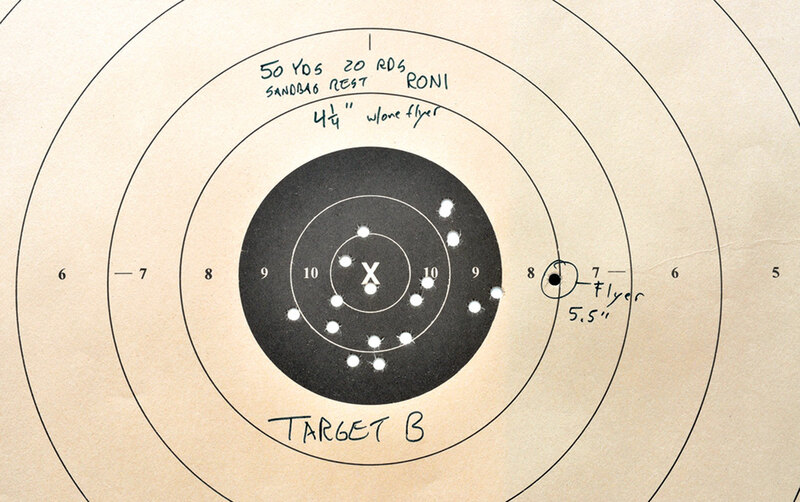 I sighted in the Glock 19-filled Micro RONI Stabilizer at 25 yards, and then shot a group. Or, at least, I tried to. Check out the photo of what I’ve labeled Target A. Notice a little horizontal movement, and a big arrow? The point of impact on the Micro RONI began shifting right as I continued to fire, ultimately moving almost five inches right from where I had initially zeroed the piece. But then—it stopped. I re-zeroed the Trijicon MRO and proceeded to pound a lot of rounds downrange, but once the point of impact was done shifting, it was done. I suspect what happened was that once live fire commenced, the Glock and Micro RONI needed a few rounds downrange before they settled into their final fit. Micro RONI Stabilizer off sandbags. That is far more accurate shooting than he can accomplish just using a Glock 19. Once I was satisfied that the point-of-impact shifting was done, I moved the target out to 50 yards and proceeded to shoot groups off sandbags. My first attempt was a 10-round group that measured a hair under seven inches. Meh. For my second attempt, I actually aimed, and did that whole “trigger control” thing I’ve read about in gun magazines, and shot a 20-round group that measured a mere 4.25 inches, once you discount the one flyer outside the black. 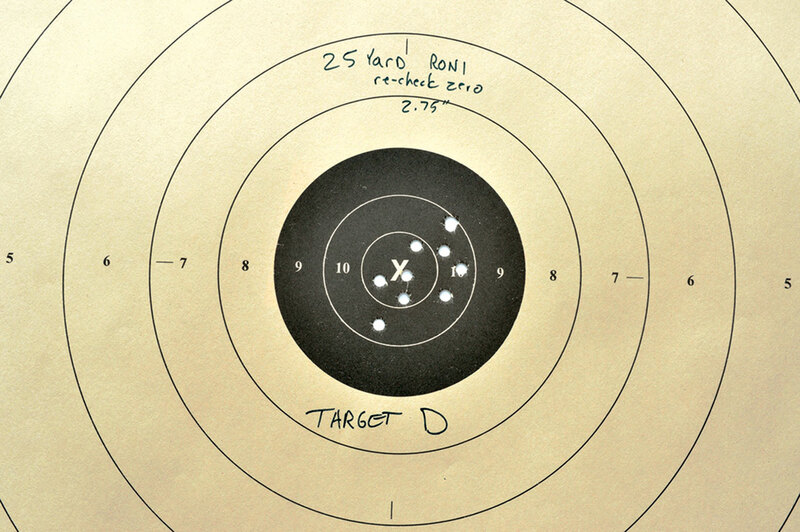 Even with the flyer, the 20-shot group only opened up to 5.5-inches—check out Target B. That black bullseye, FYI, is 5.5-inches wide. Sandbag work done, I stood up and did some offhanded shooting. The Micro RONI Stabilizer recoils with the Glock, and I could see the MRO’s dot bounce up and to the right before returning to the same spot. I’ve got a CZ Scorpion EVO pistol, which reminds me a lot of the Glock in the Micro RONI. 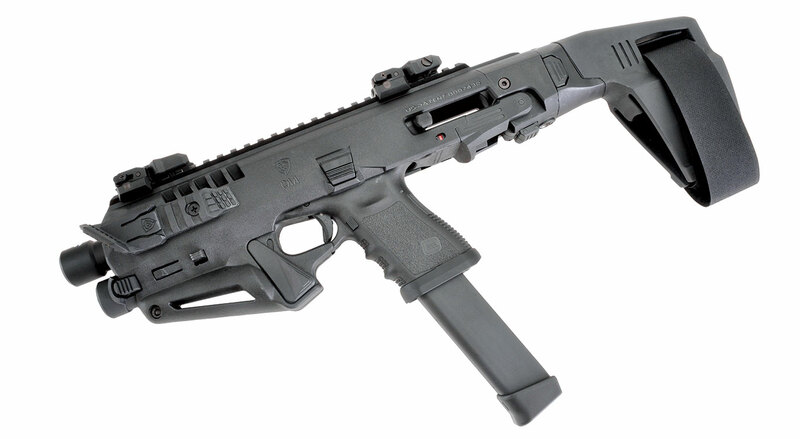 The Scorpion weighs over two pounds more than the Glock in the Micro RONI, but it is a straight blowback design, and felt recoil in the Micro RONI was the same or less than with the Scorpion. Offhand, shooting slowly, I could do seven- to eight-inch groups at 50 yards. Honestly, even though the trigger pull on my G19 is far from stock, it’s the sproinky Glock trigger that is the biggest handicap to shooting good groups at distance. Now for the test. I pulled the Glock out of the Micro RONI then stuck it back in and shot another group. I honestly didn’t know what to expect—I expected some zero shift, but whether or not the rounds would still be on paper, I had no idea. I was pleasantly surprised—my zero shift was about one inch to the left. That’s it. One inch at 50 yards would be margin of error for most handguns. 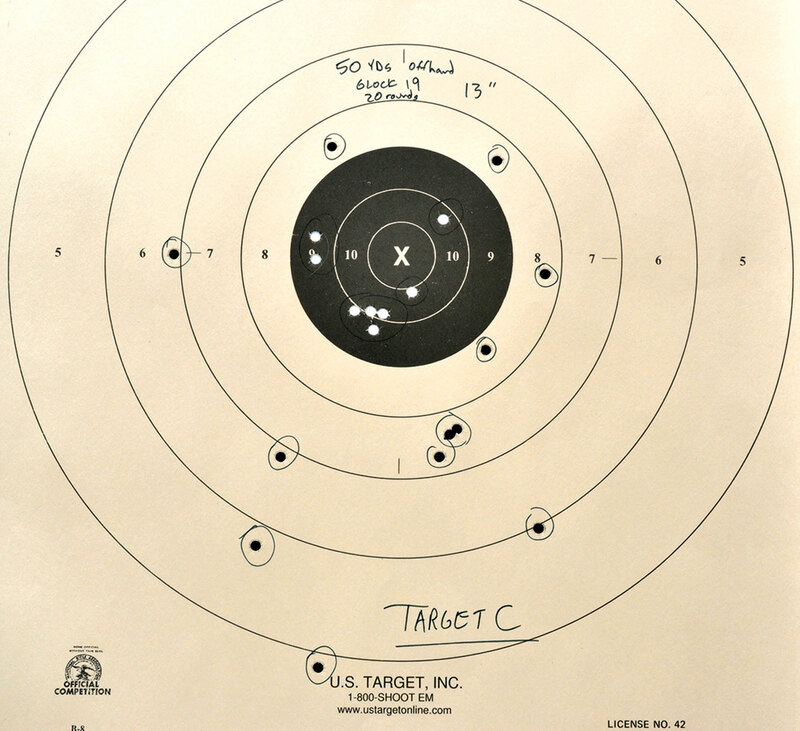 Target C: This 13-inch group at 50 yards is indicative of how accurate Tarr is with just a Glock 19 shooting offhand. With the Micro RONI Stabilizer, his groups were cut in half or better. I knew that putting 20 rounds into a group not much bigger than my palm is far more accurate than I can shoot a Glock 19 using just its iron sights, but for testing, I tried anyway. I found that my groups off a sandbag with the bare Glock at 50 yards were about the same as shooting the Micro RONI Stabilizer offhandedly, and it took me a lot more time when I wasn’t using the RONI. And shooting the Glock offhandedly, well, the one labeled Target C is pretty indicative of my attempts with the Glock—an oval 20-shot, 13-inch group. That’s of course good enough to hit a bad guy every time, but it shows the stark difference between shooting a traditional concealed-carry-sized handgun at distance and using the Micro RONI. Target D: After removing and reinstalling the Glock 19 from the Micro RONI Stabilizer twice, Tarr checked the zero, and discovered it had shifted less than an inch at 25 yards. 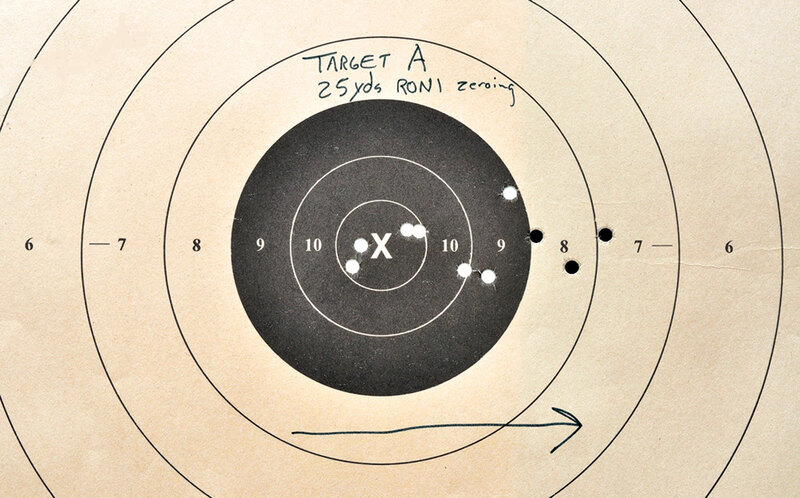 After shooting the Glock 19 on its own, I stuck it back in the Micro RONI and quickly re-checked zero at 25 yards—check out Target D. You’ll see the zero has maybe moved half an inch to the right of the original zero. To summarize, I found that at 50 yards, I could shoot roughly twice as fast, and twice as accurately, using the Micro RONI as I could using just the bare Glock 19. And removing and reinstalling the pistol from the Micro RONI does cause a zero shift, but not much more than an inch at 50 yards. I guess CAA offers that 10-year warranty for the Micro RONI for a reason—there’s very little chance you’ll need it. You’ll notice the rear sight on the RONI is not mounted all the way to the rear. If you shoot the Micro RONI with the rear of the brace near or against your shoulder, the distance from the brace to the receiver of the Micro RONI is so short, you’ll be chewing on the rear sight if you try to mount it all the way to the rear. Flush magazines are great for storage/transport, but big sticks complete the package in looks and capacity. I used both Glock factory 15- and 33-round magazines and some extended ones from SGM Tactical as well in my testing. All worked perfectly. Even though the Micro RONI is in no way a carbine, on my second trip to the range with it, I headed to the 100-yard line and did some more experimenting. While my results weren’t as pretty, due both to the increased range and the cold outdoor weather, there were no surprises—groups were roughly twice what they were at 50 yards. With the Micro RONI at 100 yards, I was able to hit Pepper Poppers almost as fast as I could pull the trigger. That’s very impressive. One thing I did notice was that with a 25-yard zero, my groups at 100 yards were about four inches low, which got me to thinking about the ballistics of pistol rounds at distance. For this article, my editor suggested I extend the reach of the Micro RONI by securing one of the extra-long Glock barrels various companies offer. Long, carbine-length barrels will give you 100–200 more fps in a 9mm, which makes a difference when you’re shooting at distance. IGB Austria makes extended barrels for the Glock 17 and 19, from 7.5 inches all the way out to 16. Its 10-inch and 16-inch barrels feature an “impulse chamber” that threads around the barrel in front of the slide. It isn’t just the slide that recoils in a semi-auto pistol, the barrel moves as well. If you add a lot of weight to that barrel (like stretching it to triple the standard length) it’s going to cause malfunctions as it slows down the barrel. The IGB impulse chamber increases backpressure to cycle the slide properly and stop those malfunctions. The backpressure is the same reason pistols wearing heavy barrel-mounted sound suppressors work. The slide of the Glock pushes right up against the aluminum barrel shroud inside the RONI, so the IGB barrels with the impulse chamber simply won’t fit. I had a 6.02-inch Glock 17L barrel on hand, but the locking block for the 17L and 19 are different sizes. IGB makes a 7.5-inch barrel for the G19 with no impulse chamber, but after examining the RONI, I realized it wouldn’t work either. Because of the way you have to pivot the gun to insert it, no barrel more than about 1.5 inches longer than the factory barrel will fit inside the Micro RONI. Most suppressor-ready extended threaded barrels are no more than an inch longer than factory, so they would work, but spending the money for such a barrel that would only marginally increase velocity was definitely not a dollars-and-“sense” decision for me. However, if you already have an extended threaded barrel, it’ll give you more velocity with no downside inside this package. When it comes to handgun bullet drop at distance, handgun bullets tend to drop like stones past 100 yards, and that’s doubly true if they leave the muzzle at less than 1,100 fps. They’re both slow and have low ballistic coefficients. precipitously past 100 yards. He does not recommend slow 147-grain loads, as their trajectories are even more rainbow-shaped. The red dot of the MRO is roughly 2.75 inches above the bore of the Glock inside the Micro RONI. Zeroed at 25 yards, you won’t have more than a four-inch drop at 100 yards as long as you’re not shooting slow 147-grainers out of your Glock 19. Past 100 yards, though, just about every pistol bullet will give you a rainbow trajectory. I’ve included a chart for quick reference of the drops of three different loads. Personally, I’ve become a big fan of the Fort Scott Fort Defense 80-grain Solid Copper Spun round for PSBRs. Out of the G19’s short barrel, it still does nearly 1,350 fps, which means it drops a lot less at distance, and because it’s so pointy, the lathe-turned copper solid bullet penetrates deeply, although it won’t expand at all. Instant faux SBR—just add Glock. If you wanted to make the most (ballistically) of the Micro RONI and were going to buy a gun to fit it rather than the other way around, I would recommend getting the model that fits the Glock 17. The Micro RONI for the G17 isn’t any larger, and, if at some point you wanted to put in a longer barrel, the six-inch barrel of the 17L will fit inside the Micro RONI meant for the G17, no problem. Depending on the load, you’ll be getting 50–200 fps more than you would out of a Glock 19. At a suggested retail of $375.00, the Micro RONI is not cheap, but it is much less expensive than buying a separate pistol-caliber carbine. For the cost of a used handgun, you can get a faux pistol-caliber SBR that is as reliable as a Glock, and, as the Micro RONI still is just a handgun, it doesn’t require any federal paperwork. James Tarr is a longtime contributor to Firearms News and other firearms publications. He is also the author of several books, including CARNIVORE, which was featured on The O’Reilly Factor. His current novel, WHORL, is available now through Amazon and Barnes & Noble.